This painting was conceived a last week while visiting the Pacific coast. As I watched the sun go down, the clouds turned rose and deep purple. 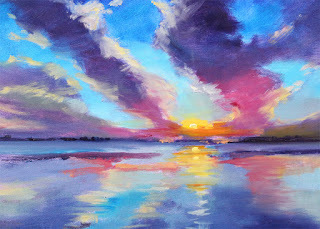 The wonderful colors inspired the painting in this season of beautiful sunsets. The original oil painting was developed on an 11x14 inch stretched canvas with professional grade oil paints. Reproductions are available here in my print shop. The original will be for sale in my Etsy Shop as soon as the paint is dry. Just got back from a week at the beach where I spent a lot of time studying the sky and the clouds and the local way of life. The result is a series of paintings featuring clouds, sky, and sea. It was a wonderful experience and I was able to participate in what the locals call, "Beach Time." From what I've discerned "Beach Time" is a relaxed attitude that isn't overly concerned about time. Things get done when they get done. Usually there is no rush. Hurry is a foreign thought. Thus, lots of time observing the environment. This painting was created in oils on an 11x14 inch stretched canvas. When the paint is dry, the original will be available in my Etsy Shop, where I sell my small format originals. 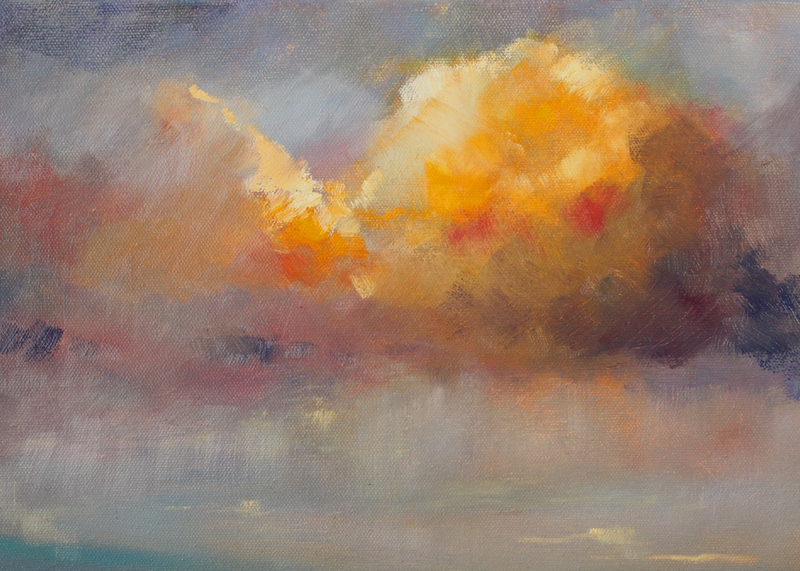 If you are in a hurry, reproductions on paper or canvas are available from my print shop, here. Everytime I go to the grocery store, my eyes are enamoured with the produce section. Stacks of fresh fruits and vegetables are colorful and full of unique shapes. Sometimes I buy fresh items just because they are beautiful, even when I have no idea how to prepare them. 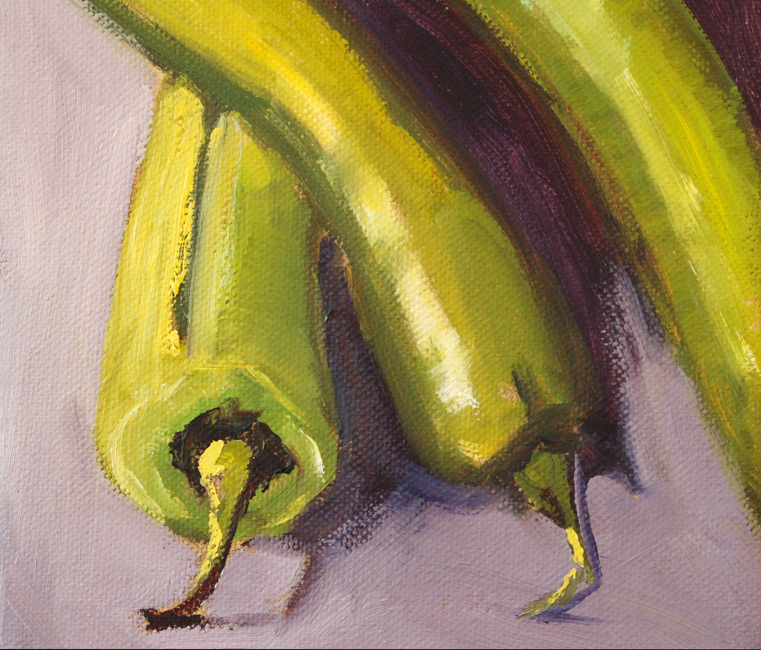 After I get them home, the first thing I do is create a still life painting, sometimes an entire series of paintings. When the fresh items have done their duty, they head to the kitchen. This time I brought home Anaheim peppers. I didn't know if they were hot or mild, all I knew was I loved their color, that mellow green, and their long, robust shape. After I painted them, I did some research and they ended up as Chile Rellenos. So good. The original 6x6 inch oil painting is available for purchase here. Larger reproductions are also available at this address. This past week I had some fun combining traditional and digital art. The background for this piece is a design created with acrylic paints on paper. I like the combination of red orange and turquoise, but it really didn't have a focus as a finished piece of art, so I decided to use it as a background. 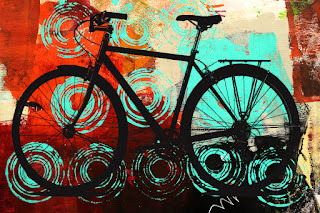 I added a digital silhouette of a bicycle and liked the results. I did a series of images that combined original work and digital overlay. Since my family and I are big bicycle fans, the designs were cheered by all. Prints of the composition can be purchased here on either paper, canvas, or acrylic. You can also view the other designs in the bicycle art series at this link. And if you want it on a pillow or a phone case, those are options, too. Beautiful yellow roses and red day lilies were the attraction when I created this little still life painting. I'm gorging on their beauty before the fall when they all disappear. 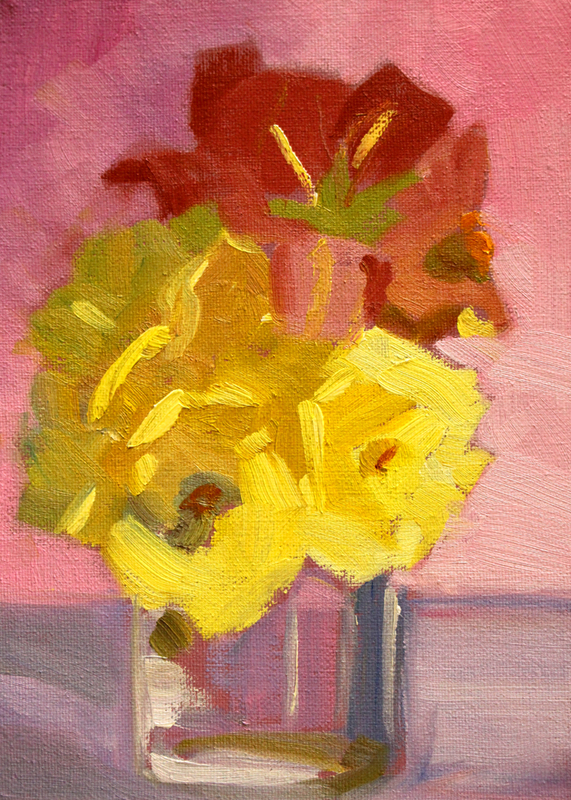 This painting was created on a 6x8 inch stretched canvas with professional grade oil paints. It is a available as a reproduction on paper or canvas here. Eventually the original will be listed in my Etsy Shop with the rest of my flower indulgences from the summer bounty.